Our society can be very tough on girls. The media tells us that the way we look is most important. Between Hollywood’s preoccupation with skinny girls and the current food trends - which emphasize foods guaranteed to make everyone obese - many girls grow up with priorities as skewed as their body image. Eating disorders are rampant. From not eating, to throwing-up food to over-dosing on diuretics, to an obsession with working out - a huge percentage of girls are focusing on how they can make their body fit a narrow definition of beautiful- not how to nurture it so that they will experience a lifetime of good health. A mother that spends the majority of her free time in front of the mirror fixing herself up and/or obsessing about her weight will teach her daughter very different things about self-worth than a mother who spends her free time going on hikes, gardening and practicing yoga. How do you feel about yourself? Do you feel good about your body? Do you nurture your body with healthy food, a variety of activities and plenty of rest? If you want your daughter to love herself and nurture her own body, think about what you can do starting now to demonstrate the values you want her to take on as her own. Let’s talk about “super women” and the “martyrs”. What do you suppose that a girl learns from a mother that tries to “do it all” and runs herself ragged making everyone else happy? Is this setting a good example of how to nurture herself? What kind of relationship is someone that is running themselves ragged going to have time for? What about a mother that lets her husband and her family boss her around constantly without ever expressing appreciation? How does your husband treat you? Is he respectful and appreciative? How about your other children? Are they respectful and appreciative? What activities do you pursue for yourself? Remember, people take sacrifice for granted at the same time they find people with their own passions interesting. If you want your daughter to discover and pursue her own passions, you need to do the same. If you want your family to respect and appreciate you, you need to demand their respect and appreciation by drawing your own boundaries so that you have time to pursue things that interest you. You deserve at least one hour each day that is just for you to do something you are interested in whether it be reading a book, painting a picture, taking a class or going for a walk. What about the mother that has no boundaries and sacrifices her entire life and all of her personal interests for her family? What if that same mother reminds her family about all of her “sacrifices” on a regular basis and uses that to get others to do her bidding? What is this teaching her daughter about her own desires? Is the mother-daughter relationship joyful or a burden for the daughter? What does that teach her daughter when it comes to building the life she desires versus manipulating others to get what she wants? Remember, we are being intentionally provocative here in order to stimulate your creative juices regarding the kind of mother you want to be and the legacy you want to leave behind. Again, the main point here is that your daughter is most likely to value the same things that you demonstrated by your actions as she grew up. 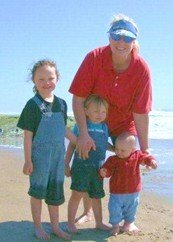 If you DON’T want her to sacrifice her own life to others or to manipulate others to get what she wants out of life – rather than working to accomplish her own goals independently – then be sure that you are demonstrating a good example about creating plans, managing priorities and working to get what you want out of life. What about the mother that is a full-time mother because she revels in being a mother and because she can’t imagine doing anything else? Will that doom her daughter if she can’t stay at home with her own kids? No way, we don’t mean to give you that impression! Sure, you aren’t setting an example for how to balance work and career, but you are setting a great example for reveling in family time and pro-actively choosing your own destiny. Are you guaranteed that your daughter will learn the things you desire if you do everything “perfectly”? No, but you are giving her the best chances at the same time you create a life without regrets. To the extent you balance your own needs with your family’s needs; you are setting the best possible example. Some mothers spend a lot of time cooking and nourishing their family. Others regularly swing by McDonalds and serve Happy Meals for dinner. In these two examples, the daughter is learning vastly different things about the importance of good nutrition. Some moms spend a lot of time cooking together with their children – both boys and girls – demonstrating the value of good nutrition and the importance of constructive family time. A mother that takes her children hiking is teaching her children a very different thing than the mother that spends the majority her time in front of the television. If you want your kids to go outside and play, it is much easier to do that from outside the house that from inside on the couch! More than anything, a mother models the male/female relationship to her daughter. A mother that accepts physical and/or verbal abuse from her husband will teach her daughter something very different than a mother that insists on respect. Perhaps the most damaging thing about a mother staying in an abusive relationship is the example she is setting for acceptable treatment. Unfortunately, these unstable and unpredictable situations become familiar and something that her daughter may crave in the future. She may confuse love with dysfunctional behavior because that was the kind of relationship her parents had growing up. Some girls even grow to crave the intensity of the highs and lows and are unable to appreciate stable, loving relationships as adults. Now that we have gotten you thinking about what values you want to pass down to your daughter(s). It is time for you to create a mission statement for your family that highlights these values. To be happy and extremely healthy with plenty of money, togetherness, love, family time, adventure, fun, laughter, interesting projects, constant learning and growth, commitment to education, appreciation of nature, affection, mutual support and deep respect. Next take a piece of paper and create a little table. Write each value on the left hand side with the value you prioritize most highly at the top and the least at the bottom. To the right of each value, write down the activities that you currently pursue on your own in support of each. To the right of that, list the activities you do regularly together with your children for each value. Next, share your table with your husband and children. Create additional columns for each family member to document the activities they do individually in support of each value. Ask them to contribute additional value to the table as well. You don’t need to have every box filled out. Finally, post your list of family priorities somewhere where they are visible to all (refrigerator, framed on wall). As soon as your children are old enough talk, explain what each value means to you and why you think it is important. As your children get older, hold regular family meetings to discuss family and individual priorities and goals. Ask your kids for input on the activities you do together. Build and agree upon a family schedule that is in alignment with your family values. 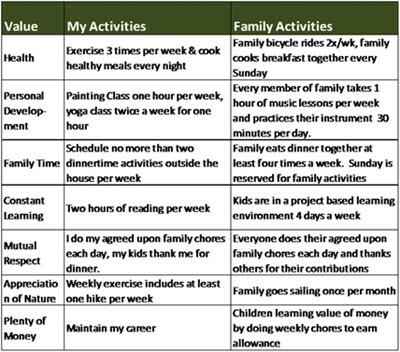 Evaluate new activities and changes in the family’s schedule & activities based on these “family priorities”. There are all kinds of successful mothers out there. Our best advice is to provide your daughter unconditional love and to demonstrate through your own actions the values you wish her to have. We hope this article will help you proactively be the kind of mother you want to be! What is the most important thing you want to teach your daughter? What is the most important thing that your mother taught you and how did she do it? Do you have any tips for cultivating a strong mother-daughter relationship?